I've thought for a bit about what I consider to be a friend. It's not like there is some clearly drawn out line defining what is friend what is lover what is acquaintance what is a confidant what is a stranger? and there are many more things in life that are even more unclear, even more loosely understood. words can only reach for, can barely grasp these abstract things. the nuances of human relationships are impossible to compass entirely using language, visual, whatever. take for example this page I just found with a quick google search looking for types of relationships. 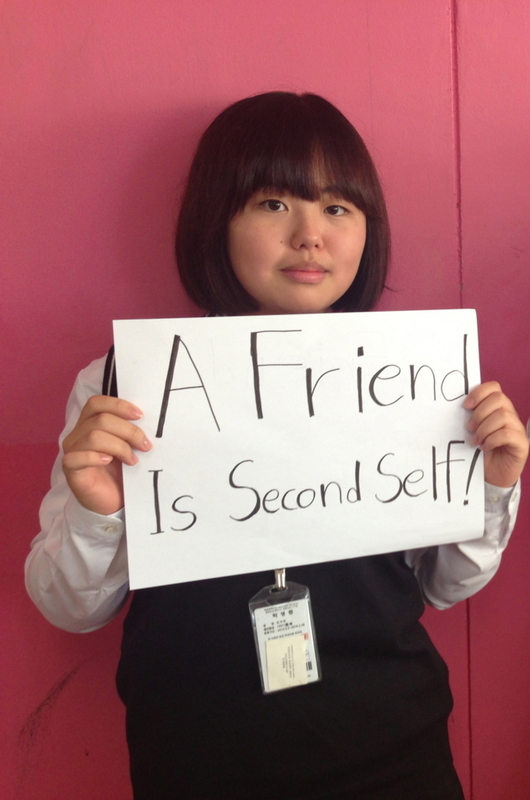 when I came across the above photo on Korean Students Speak, it sparked even more thought. if we were to befriend a carbon copy of ourselves, would we enjoy the friendship? would we become the best of friends? or would we despise each other, would a rivalry form? this is a common thing people think about with romantic relationships. the whole thing about being in love with yourself, the "opposites attract" thing. it's commonly believed that you'd get bored in a relationship with yourself, run out of things to talk about, have nothing to "discover" about each other because you both already know everything there is to know. but of course you'd look for something different in a friendship than a romantic relationship? i personally love a low maintenance friendship, as someone that can't go out too much, can't respond to too many texts, can't spend too many hours chatting before losing my mind. i love the kind of friendship that i don't need to tend to constantly as one would with a baby, but you still know that the loyalty exists and it's mutual. it's strong. so maybe this doesn't make sense but i'd give it a shot, being friends with myself. i sometimes feel like i'm too picky in choosing my friends, leaving me with almost none at the end of the day. but surely that's a good thing? quantity over quality? it just leaves me feeling a little stranded. a little alone. hopefully, as with all turmoil i've experienced in my short life, i'll find out a solution soon and look back wondering what i was ever worrying about.